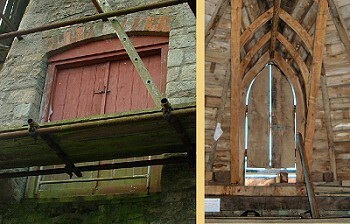 The Mill has four doors, three in the Tower and one in the Cap. The door in the cap is situated so as to allow access to the Tail at the rear of the Cap. This is required as the Tail is the area used to Turn the Cap. A view of this door from the inside of the Cap can be seen above. The Tower has three doors, two on the side of the mill facing Wheatley and the other on the opposing side. The two doors on the Wheatley side are at different levels. 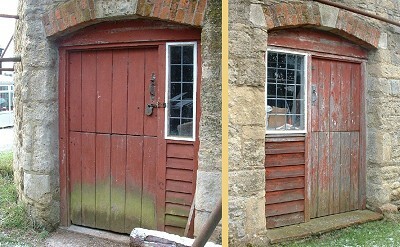 The upper door is the loading door (pictured above) and opens into the Stone Floor level of the mill. It is thought that this door was used when grain was received. The farmer would drive his cart up to the side of the mill and lift the bags the small distance up in through this door. From there they could be hoisted up to the Bin Floor. The two lower doors are at the Ground Floor level and provided access to the mill for the miler and a door to take the milled flour out of the mill. The doors are on opposing faces so that no matter in which direction the Sails were set one door would remain unobstructed and would be safe to use. A picture of both of these doors can be seen below.